An estate plan is one of those things that everyone needs but no one wants to think about. Estate planning involves considering some unpleasant topics, such as your own death and what will happen to your assets after you pass away. But it’s essential to put some thought and planning into this subject; failing to do so could result in an increase in your family’s distress after you pass away. 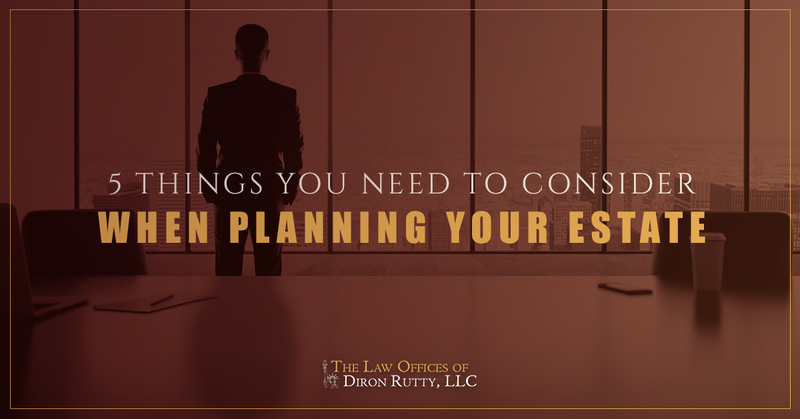 The Law Offices of Diron Rutty, LLC offer estate planning services that can help you ensure that your final wishes are executed after your death. We’ll make it as easy as possible to make a cohesive, comprehensive plan for your estate. When you decide to start creating an estate plan, there will be many things to consider. Start thinking about the answers to these five questions before you make your appointment with our office. Do You Know the Answers to These Estate Planning Questions? You’ll want to compile a complete list of your assets when you start estate planning. What happens to a lot of these assets will depend on whether or not you are married, have children, or have made a will that stipulates what you’d like done with them after your death. You may want to consult with an attorney to determine what is and isn’t considered an asset; you probably have more assets than you think. Start by documenting all of your accounts, including checking, savings, retirement funds, and investment accounts as well as debts such as your mortgage and car loans. Do you need to provide for anyone after your death? In most cases, if you are married at the time of your death, the majority of your assets will pass to your spouse automatically. If there is anyone else that you would like to get a share of your assets, you’ll need to stipulate that in your will. This might include any minor children, a handicapped dependent, or even your pets. Talk to an attorney about these relationships and discuss your options about how you can help ensure they are cared for. Make sure that you are upfront about any dependents; secrets that come out after your death and aren’t addressed in your will can cause intense grief for those you leave behind. Your attorney will keep this information in strict confidentiality. Who will be the administrator of your estate? You’ll want to choose a trustworthy person who can execute your final wishes. This can be anyone, but you’ll want to pick someone who you feel you can really trust. Sometimes the people you are closest to aren’t the best option for the job; their own emotions could be running high after you pass away and they may not be able to think clearly about your estate. Sometimes, your lawyer or another professional is the best person for the job. Are all of your important documents updated? Procrastination is your worst enemy when it comes to estate planning. While you could very well have 20 or 30 more great years ahead of you, it’s important that you plan for the worst. That means keeping all of your information updated. Make sure important documents like your will, power of attorney, living will, and medical power of attorney are all kept up-to-date and in a safe location (like a safety deposit box at the bank). Additionally, you’ll want to make sure that your life insurance and investments are current and that the information about these accounts is in a safe location your family can access if needed. Who will make medical decisions on your behalf? Sometimes, death doesn’t come quickly. You may become sick or incapacitated and be unable to make decisions on your behalf. In this kind of worst-case scenario, you need to make sure that your wishes are still being followed. An estate planning attorney can help you do this through a living will. This document will instruct your family as to what measures you wish them to take in order to save your life after an accident or in a critical illness. It can prevent your family the pain of having to make that decision themselves and prevent something happening to you that you didn’t want. You can also assign someone to make those choices on your behalf, most often a spouse. There often are not easy answers to these questions. It may take some time to determine those answers, and that’s okay. Working with an estate planning attorney can help to make those choices easier. An attorney can help you prepare the necessary documents, make those decisions, and ensure that everything is in order when your time comes. These preparations can ease the pain of the living you leave behind; they’ll know that you loved them and wanted to prepare them for the tragedy of losing you, providing them with a clear road map of what happens next. This can take some of the stress out of the situation for them and allow them the time to grieve for their loss. If you want to ensure that your final wishes are known and followed, we can help. Contact the Law Offices of Diron Rutty, LLC and make a consultation appointment. These initial appointments are available free of charge and are strictly confidential. It will give you an opportunity to learn more about our estate planning services and how we can help you create the important documents and plans your family will need after you are gone. Get in touch by giving us a call or contacting us through our website today.